One of my grandsons spent the night last week and out of the blue, he asked me if I would make a dinosaur cookie like the one on his pajamas. How could I say "no" to such a request:) I think his request for a specific cookie design was the first one I've received from one of my munchkins (grandchildren). Thank goodness this p.j. dinosaur was not technical, but rather a simple, whimsical design. To accomplish my cookie goal, I traced around the dino with a piece of white paper, cut it out and then transferred it to a piece of cardstock which I used as a template for cutting out the cookie dough. 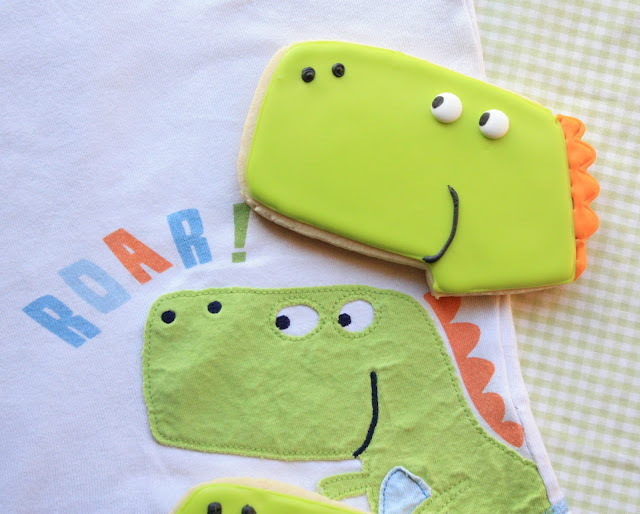 It's a big cookie (well, it is a dinosaur! ), measuring 6-inches by 3.5-inches! Because of its size (I wanted to reproduce the original as closely as I could), I opted to do the head only. Mix up a batch of sugar cookie dough and royal icing. Make a template(with heavy paper) of your dinosaur, unless you are using a cookie cutter. Roll out cookie dough and place your template on the dough. 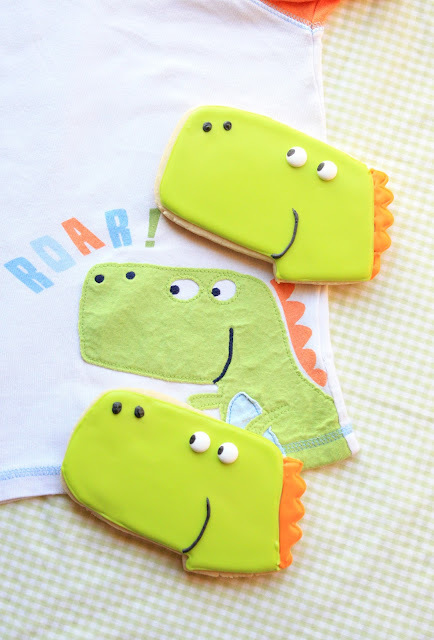 Cut out the dinosaur(s) with a sharp, small knife and place on baking sheets. Bake at 350 degrees for about 15-18 minutes depending on the thickness and your oven. Divide royal icing up and add food coloring. I used AmeriColor soft gel pastes: Electric Green, Electric Orange, and Super Black. Outline the dinosaur head in green with the #3 tip. Outline the scales(?) in orange. After about 20 minutes fill the dinosaur head in with the green icing and the scales with the orange. After the green has dried completely, add the black smile and nostrils. Have fun and make your own dinosaurs extinct! Eeeeeeek these are SOOOOOO adorable Sue!! What a great idea!! the dino is very cute and I love the electric green color. These are adorable Sue...I just love them! A must make for my grandson!! Sue these are so fun! You are so clever! So cute!! and if you turn that dinosaur head upside down it makes the perfect head for golf club too! These dinos are adorable. Your grandson must have been absolutely thrilled with them. oh, my gosh! you're so talented. those are awesome! Adorable cookies and adorable story! What a fun Grandma! Cute, cute dino! This is so fun! I've never thought about goiny beyond cookie cutter shapes with sugar cookies. Thanks for sharing! SOOOOO cute! Love these cookies! Hi Sue ;)) you are my "Cookies Queen"! What darling cookies! You reproduced the dinosaur perfectly. Your munchkin mush have been thrilled. By the way, I wanted to let you know that I'm keeping your son in my thoughts and prayers, and hoping he's okay. As soon as I saw these on Facebook, I saw that I hoped you would show us how you did them. They are so adorable! I bet your grandson was so excited to see the finished product! What a super cool grandma you are Sue! pretty sweet...what an awesome grandma you are!!!! They are so whimsy, I agree!!! These are just adorable Sue!! I love how anything inspires you cookie girls!! These are so incredibly cute, Sue. What a great grandma you are to make this on request. They look perfectly like the cute dinosaurs on his PJs too. You are the best Gramma EVER!!!! Your cookies are wonderful! What a darling dinosaur and a darling request. I know I can't say no to my adorable grandkids either. I am sure this is just the beginning of the requests from the munchkins grandma! There is no possible way on Earth one could look at that and not smile. You are such a wonderful grandma. Our girls haven't spent the night at grandma's yet, but I am looking forward to the night when grandma is ready for them! omgggg!!!! this is cute beyond words!!!! you replicated the dino design flawlessly. wow So adorable! I bet all your grand kids love you dearly!